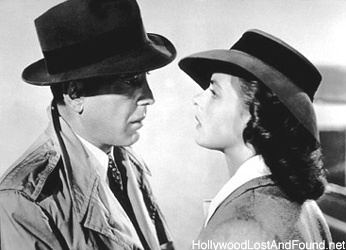 Hollywood Lost and Found - Making "Casablanca"
Creating the film "Casablanca" was filled with so much uncertainty and chaos that the people behind it would probably have never guessed that it would turn out to be one of the greatest motion pictures ever made. The film's colorful characters, melodramatic moments, cynical humor, and romantic triangle - all taking place in an exotic locale - have helped make the film a classic. In 1938, Murray Burnett and his wife Adrienne took a trip through Europe. During the trip, the two visited a small town in the South of France where they found a nightclub overlooking the Mediterranean. There, a black pianist playing jazz was entertaining a crowd of French, Germans, and refugees. Burnett remarked to his wife what a marvelous setting for a play it would be. Two years later, Burnett and his collaborator Joan Alison wrote a play called "Everybody Comes to Rick's." The play indeed takes place in a similarly described nightclub in Casablanca, French Morocco, owned by Rick Blaine. His friends are Sam, the piano player at the cafe, and Rinaldo, the French Prefect of Police. 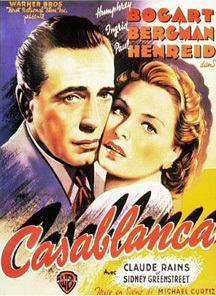 One evening, Ugarte, a dealer of stolen exit visas, asks Rick to hold some letters-of-transit he plans to sell for a fortune - his last sale before he goes straight and leaves Casablanca. Rinaldo enters with Gestapo Agent Strasser, and they arrest Ugarte before he can sell the letters to Czech patriot Victor Laszlo. Later, Laszlo enters with Lois Meredith - whose presence has Rick shaken. 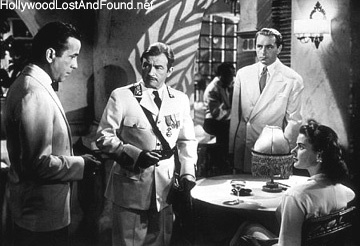 Strasser confronts Laszlo, telling him he will not leave Casablanca until he signs his millions stashed in foreign banks over to Germany. That night, after everyone has left, Sam begs Rick not to get involved with Lois again. But she soon arrives to see Rick, and the two spend the night together. She begs him to help Laszlo. Will Rick give Victor Laszlo the letters-of-transit to escape Casablanca? And will Lois leave with him - or stay with Rick? On December 8, 1941 - the day after Pearl Harbor had been attacked - Warner Bros. story analyst Stephen Karnot read the play, and a few days later submitted a synopsis to production head Hal B. Wallis, along with the recommendation to turn it into a film. On the 27th of December, the studio purchased it for $20,000. Along with the basic characters and framework, many details from the play found their way into the screenplay. In both the play and the film, Rick makes a bet that the freedom fighter will escape; Rick's competitor, the black-marketeer Ferrari, offers to buy Rick's cafe; and Laszlo drowns out the Germans by leading Rick's patrons in "The Marseillaise." Many memorable lines of dialogue came originally from the play as well, including "Call off your watchdogs," "What a fool I am, talking to a beautiful woman about another man," and "No one ever loved me that much." Ultimately, many writers helped translate the play successfully to the screen, working on the story structure and plot, as well as adding to the personality and motivations of central characters. Aeneas McKenzie and Wally Kline had spent the first six weeks of 1942 adapting the play, with the brothers Julius and Philip Epstein continuing the work after them. To direct the film, Hal Wallis had considered hiring William Wyler. But he gave the job to Michael Curtiz, who had previously directed "Captain Blood" (1935), "Angels With Dirty Faces" (1938), and "The Adventures of Robin Hood" (1938). On February 14, 1942, Wallis sent a memo to Steve Trilling, the head of casting at Warners, stating that Humphrey Bogart and Ann Sheridan would be the leads in the project, although the studio - eager to generate publicity - had already told the Hollywood Reporter on January 5 that the film would star Sheridan, Dennis Morgan, and Ronald Reagan. A few days later, it was decided that the female lead should be European, and the character's name was changed from Lois Meredith to Ilsa Lund. Ann Sheridan was no longer a likely candidate. The beautiful Swedish star Ingrid Bergman was chosen for the role. She was in Hollywood to star in "Intermezzo" (1939) recreating a role she played in a 1936 Swedish production, and was under contract to David O Selznick, head of production at MGM. Negotiations to loan her to Warner Bros. was stalled by Selznick. Both he and Bergman were hoping she would be cast as Maria in Paramount's "For Whom the Bell Tolls" (1943), but that role went to Vera Zorina. Bergman was then traded for Olivia de Havilland for 8 weeks. Later, however, Zorina was let go from the picture, and Bergman was offered the role of Maria the day after "Casablanca" had wrapped.